by December 1st for the Spring test and June 1st for the Fall test. Unless otherwise indicated Dan tests are regularly scheduled for the first Saturday of the month in February and August of each year and start promptly at 9:00 AM. Applications not received by these deadlines may be returned. Cho Dan Bos must attend at least 1 (one) Black Belt Camp (or equivalent) before testing for Cho Dan. Cho Dans must attend at least 2 (two) Black Belt Camps (or equivalent) as Cho Dan before testing for E Dan. 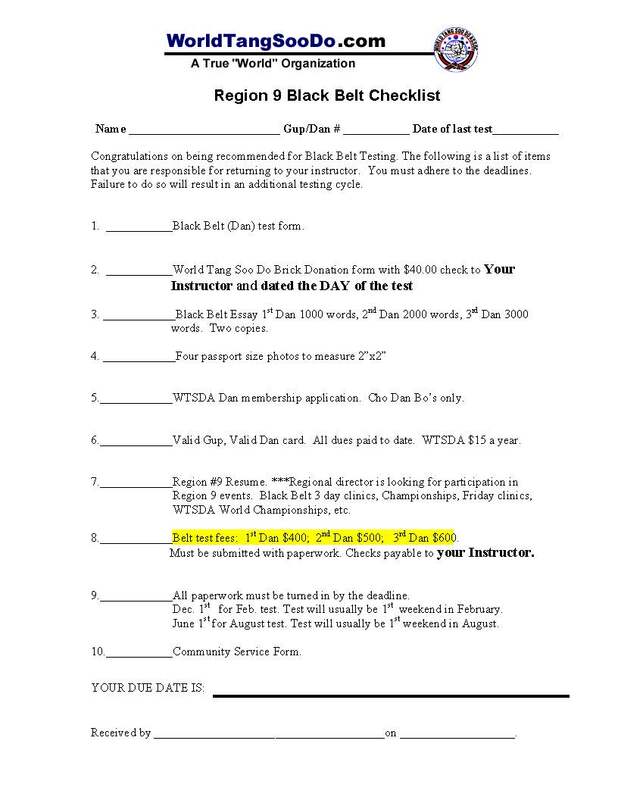 E Dans must attend at least 3 (three) Black Belt Camps (or equivalent) as E Dan before testing for Sam Dan. See the regional director to discuss what are equivalent events. All forms and instructions are included in the following Dan Test Application Package. Click the hyperlink below to down load the package. All forms can be then be filled out on your computer and printed. Region 9 Dan test Application Package Please attach the first page "Region 9 Dan Test Application Checklist" to the front of a 9x12 inch manilla envelope. Please put all other elements of your application inside this envelope. Sam Dan candidates MUST be certified as a corner or regional center judge as a requirement before testing for Sam Dan.